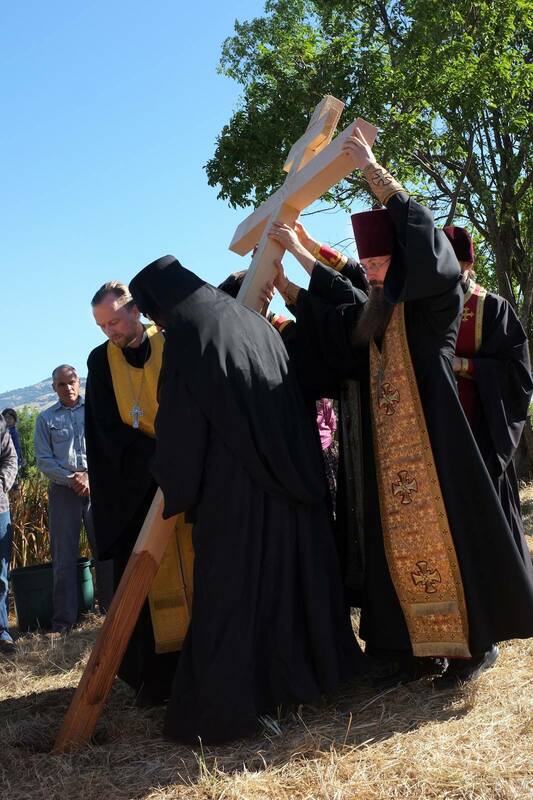 By the grace of God, on July 13, 2016, our parish held the official Service for the Planting the Life-giving Cross and the placing of the Cornerstone on our property. In the eyes of the Church, this was the official commencement of our planned building project of our new temple on South Valley View Road in Ashland, OR! The service was presided over by His Eminence Archbishop BENJAMIN of San Francisco and the West, assisted by Priest Andreas Blom (Rector of Archangel Gabriel Orthodox Church), Hieromonk Damascene (Abbot of St. Herman’s Monastery, Platina, CA), Archpriest Isaac Skidmore (Archangel Gabriel Orthodox Church), Priest Daniel Mackay (Rector of St. John the Wonderworker Serbian Orthodox Church, Eugene, OR), Priest Ian Shipley (Rector of Ss. Cyril and Methodius Orthodox Church, Chico, CA), Priest Theodor Svane (St. Seraphim Orthodox Church, Santa Rosa, CA) and Deacon David Greenfield (Ss. Cyril and Methodius Orthodox Church, Chico, CA), as well as many faithful from Archangel Gabriel Orthodox Church and other visitors. Glory be to Jesus Christ! Let us all continue to labor together, for the glory of God in His sanctuary!